Feeling a little old school? If you're like me, you're just feeling old. Toy companies have been giving us all kids of oldies but goodies on the shelves this last year, including Cabbage Patch Kids, Sizzlers, and Strawberry Shortcake, so it's clear that retro is in. When it comes to Marvel figures, Toybiz is out and Hasbro is in. 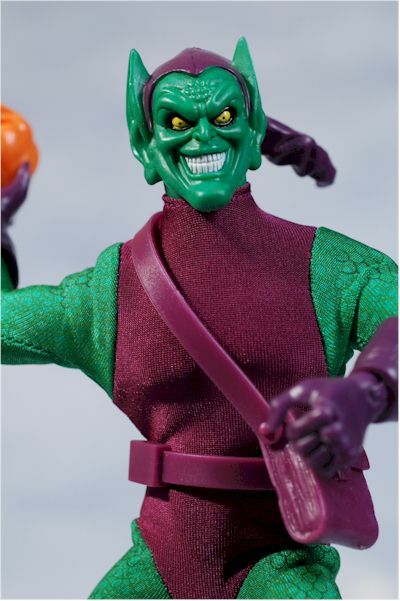 Hasbro just happened to do a 9" Mego/Famous Covers style of action figure back about 6 years ago, and they must still have those molds around, because they've turned them loose with the new Spider-man Origins line. These 9" figures harken back first to those figures of less than a decade ago, but even further back to the Megos of our youth. Well, your youth - I'll stick with my Captain Action thank you very much. There are four figures in this first release, obviously effected by the film franchise - Spider-man, Symbiote Spider-man, Green Goblin and Doctor Octopus. 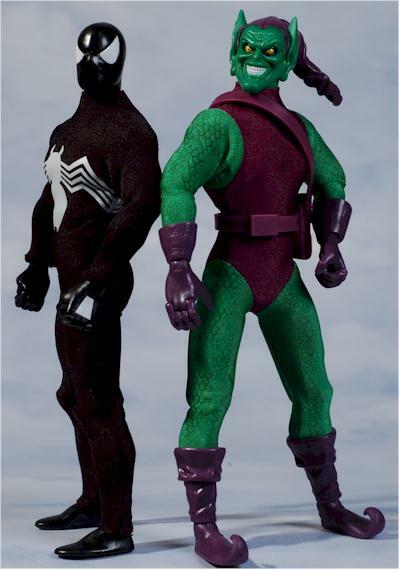 I have a review up of the regular Spider-man and Doc Ock over at Quick Stop right now, and tonight I'm covering the black suited Symbiote Spider-man and Green Goblin. These are hitting retailers like Target and Toys R Us currently, and run around $15. 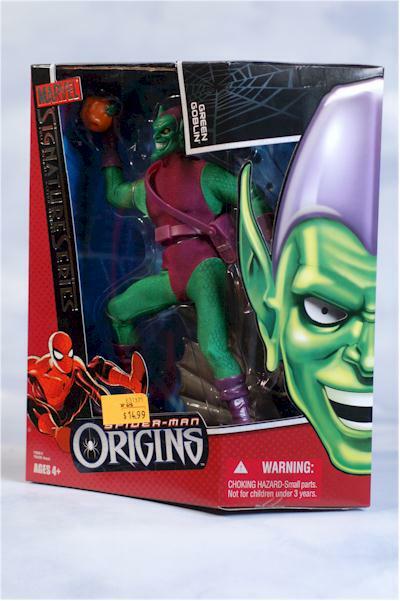 The boxes look good, particularly the Green Goblin's, which has a 3-D effect going on with the large eyeball. They aren't exactly collector friendly - there's a million twist ties - but you could theoretically replace the figures if the effort was worth it to you. Too bad they didn't go with the style of trays like the old FC's, where the tray held the figure in a pose and no twisties were necessary. The personalization of the boxes goes a long way to making these get a high score, but there's also very little waste, which is always another plus. This isn't a series that's intended to be the finest collectible version of the characters ever produced. They won't have top notch sculpts or perfect paint jobs. They are a nostalgia based concept, looking for a mass market reception. Both of these have that kitschy cool about them, but GG is clearly the winner. With a maniacal head sculpt and expression, he's almost as good as his FC predecessor. There's evil in those eyes, and a feel of quick movement in the flow of the hat. The goofy boots look right on his feet, and using the cuffs on the gloves and boots works quite well. His hands are articulated, and the sculpts work well with the basic single pin design, allowing him to actually hold the bombs if you get them just right. Spider-man is about as simplistic of a sculpt as possible. There's no webbing like on the normal version, and the head is almost completely smooth except for the edges of the eyes. There's even almost no nose bump, and that's likely to be a big complaint. The hands are both the standard versions, another difference with the regular version which had the web shooter posed right hand. Both figures stand great on their own of course, and the sculpted feet don't interfere in any way. The paint work on these two is quite a bit different. There's a fair amount of detail work on GG, and all of it is slightly above the mass market average. There's very little slop, and good definition and cuts between colors. They even managed to match up the plastic costume parts to the color of the suit pretty well, which is always very tough to do. Spidey doesn't do as well. There's more slop here, particularly around the white eyes. With distinct colors like black and bright white, this type of error is even more obvious. On both this and the regular Spider-man, it looks like the masking tools are held tight enough to the head, or there's too much play in the tool, allowing the head not to line up perfectly every time. 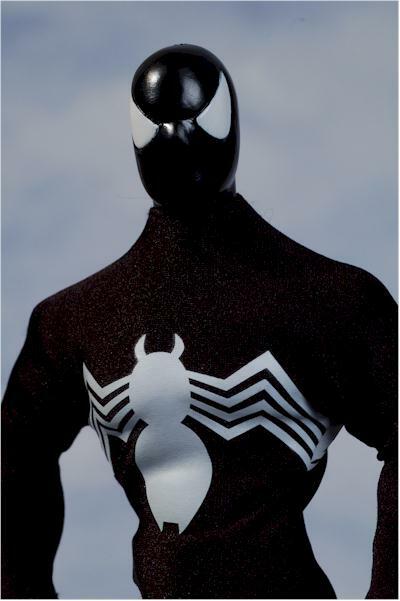 Spider-man also has the white squares on the backs of his hands, part of the traditional symbiote suit. 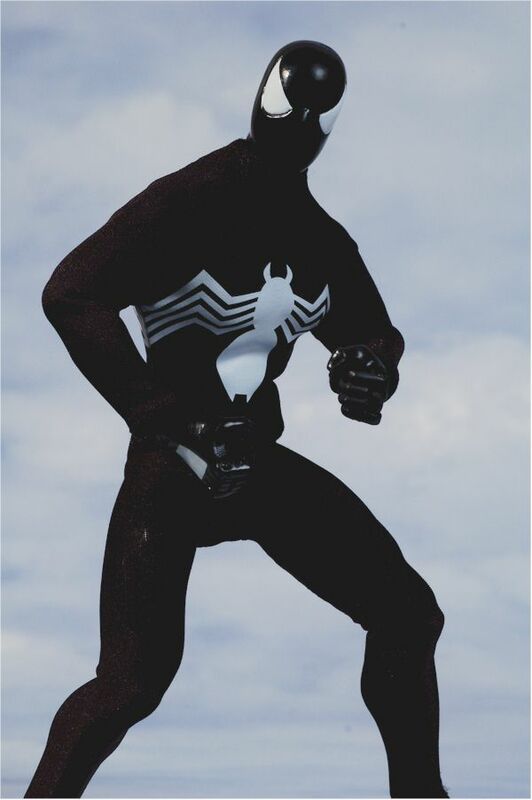 I haven't seen anything like that on the movie symbiote suit though, but I'm not complaining. The DC 9" body is being used here, and it has all the same articulation it did six years ago - cut neck, cut bicep, ball jointed shoulders and hips, pin elbows and knees, pin wrists and ankles, and the waist and chest joint you probably remember. It was good articulation back then, and it's still reasonable, although the same joints on the Famous Covers bodies were much better engineered, particularly in terms of proportions. The Hasbro body tends to look stumpy, with arms that are a tad too short. Also, these guys really need a ball jointed neck. I've preached on it for a long time, but there's no single joint that can add (or detract) as much from a figure as that ball joint at the neck, especially when it's done really well. Nope, poor Spidey gets the shaft on this one. No accessories for you. 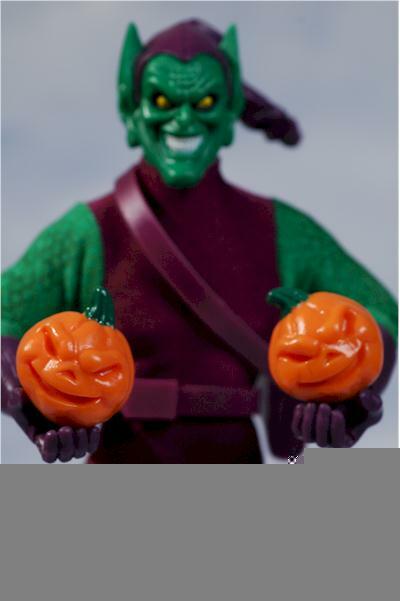 But Green Goblin has several, including his cool glider with elastic straps to hold his feet, and two identical grinning pumpkin bombs. The bombs can be held in his hands, but I think small pegs on the bottom of the melons with holes in the palms of the hands would have been a huge improvement. He also has his 'man bag', better known as a purse, that somehow he supposedly used to carry the large pumpkin bombs. Personally, I think he was just metrosexual before it was cool. All of these accessories are actually re-used from the old Famous Covers version of the Green Goblin. When they took over manufacturing from Toybiz Worldwide, Hasbro must have managed to snag those old molds, or they had a bunch of extra cast parts in inventory. Of course, that begs the question that if they were able to get a hold of the old accessories, why not the old FC bodies, which were always superior to the Hasbro 9" versions? There's no paint ops for any of these accessories (with the exception of the green stems on the pumpkins), all of them being cast in the colored plastic that you see. That makes them a tad cheap looking, but not surprising for a mass market toy. The cloth suits on both figures are made from a quality material, a little thick, and stitched on tight to the bodies. Sure, there's always some wrinkling when you twist the arms or pose the legs, but that's the nature of material, no matter how tight. In fact, they're a little too tight on Spidey, getting caught up in his crotch in some rather unflattering ways. But I'd rather too tight than too loose, which I'm betting is a pretty universal opinion. Hey! I wasn't talking about that! 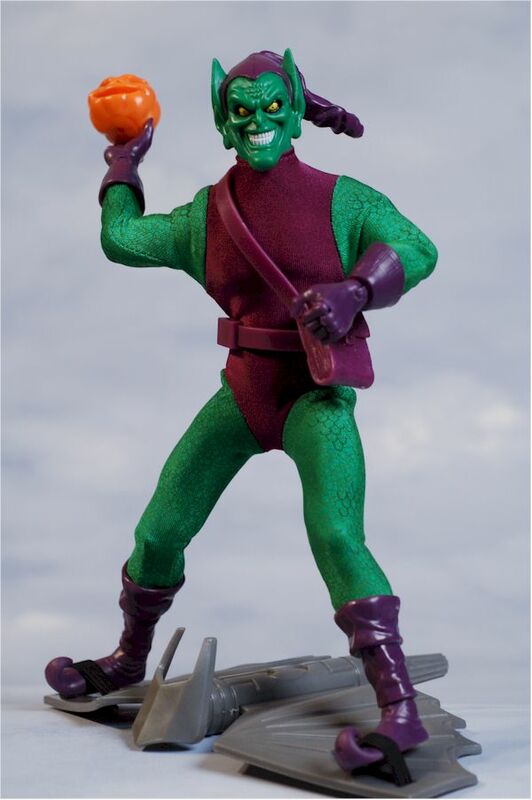 Green Goblin, like the Doc Ock and regular Spidey, has hard plastic 'cuffs' for both his boots and gloves. The suit is glued up inside these tightly, so that it stays put. This results in keeping that tight fit, and works pretty well. Symbiote Spidey breaks tradtion, and has no cuffs on the hands or feet. Instead, the suit just ends at the wrist and ankle with a hem. 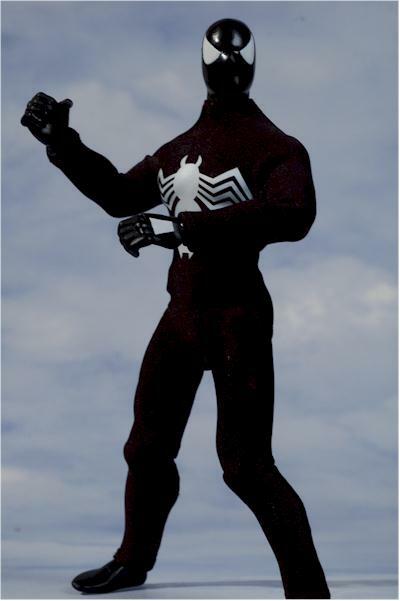 This, along with the utter lack of any sort of detail on the black of the costume or the entire head, makes for an extremely plain looking figure. His saving grace is the white spider symbol on the back and front of course, which is done extremely well for this price point. There are no cracks or defects, and the white application is nice and thick and consistent. Unfortunately, that one feature can't make his otherwise dull outfit shine. 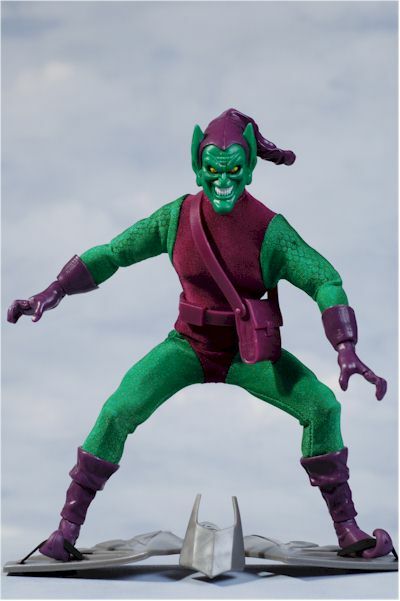 Green Goblin has a scale pattern included on the green sections of his costume, and he comes with the removable belt that he's stolen from his Famous Covers look alike. While these might not be cutting edge, they are fun. They'll stand up to play extremely well, and the 8 - 9" scale works really well with kids. It's not too big to be tough to handle, but it's not so small to be insubstantial. Oooo, I'm a poet. I think I should sell that as a marketing tag line for some sort of male enhancement medication. At around $15, you're pretty much paying for what you're getting. The ML Icons are about the same price, but a far better value, considering their size and the pack in comics. These really need to be more in the $10 - $12 range for you to feel like you're getting a solid value, but at this price you'll be luke warm. Not a thing. Of course, you'll want to pick out the best paint jobs and ensure that the white spider on Spidey's outfit is free of any cracks or breaks, but after that it's all smooth as whipped butter. Of the four, the Symbiote Spidey is my least favorite. Because the costume is so plain and lacks the cuffs, he looks the most like a guy in a cheap Halloween costume. When it comes to GG, there's one big question - do you already have the FC version? If you do, then picking this one up is a real stretch. Sure, he fits in a little better style and size-wise with any other DC 9" figures, but is that a big enough deal to pick him up? It's going to be a tough call for most collectors. Of course, this is all under the understanding that you like this retro style of figure. If you don't, then these simply won't be your thing. Even if you are into them, the best of the bunch is really Spider-man, with Doc Ock and GG coming in second. 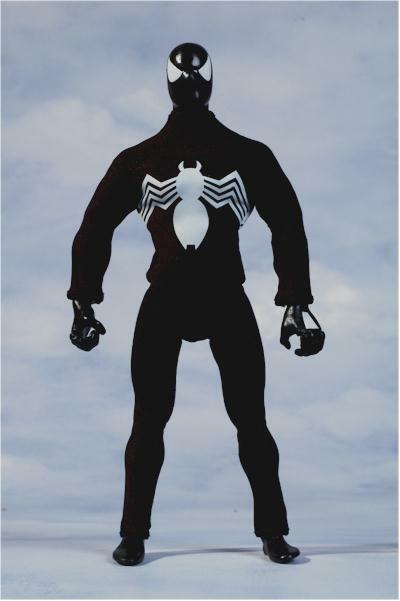 For those of us looking to add to our 9" collection of clothed goofy super heroes, the previous versions from FC of Spider-man, Symbiote Spider-man and Green Goblin already fill the bill, so the only real must have is Doc Ock. Your best bet right now is large retailers like Target or Toys R Us. 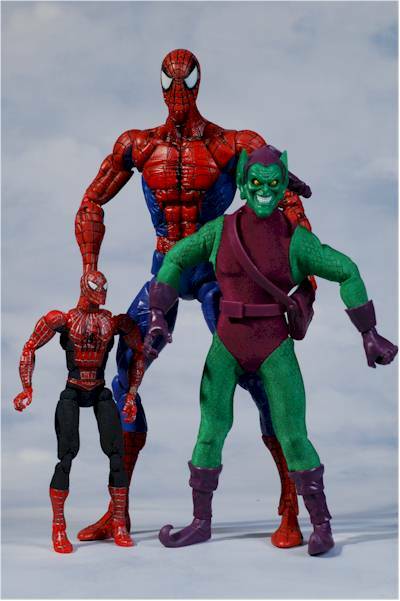 I have a ton of Spider-Man related reviews out there of course, but the two most recent - and relevant - include the other half of this review, which looks at the 9" Symbiote Spider-man and Green Goblin, and the new 12" Spider-Man in the Marvel Legends Icons line up.